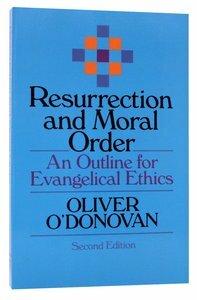 About "Resurrection and Moral Order"
Prof. Oliver O'Donovan PhD DPhil FBA is Professor of Christian Ethics and Practical Theology at New College, University of Edinburgh. He was Regius Professor of Moral & Pastoral Theology and Canon of Christ Church at the University of Oxford from 1982 until 2006, before which he taught at Wycliffe Hall, Oxford (1972-7) and at Wycliffe College, Toronto (1977-82). He is a past President of the Society for the Study of Christian Ethics. Ordained as a priest of the Church of England, and has served on the General Synod. He has been a Fellow of the British Academy since 2000.